Sheesh, I've been busy. And the first thing that always goes when I'm busy is feeding myself. Let's be honest here, sometimes it can be a chore. But that's not what I want to talk about anyway, better to just forget about it and try to do better next week. So summer. 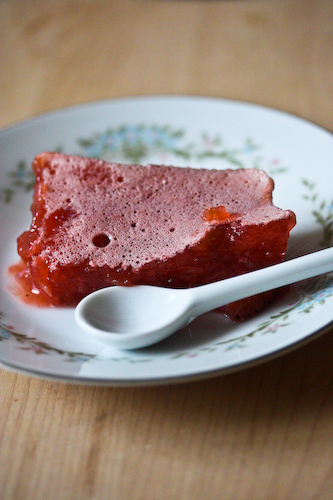 I have to say, this Norwegian rhubarb cake has been pretty popular, and although I also love it, what I've really been obsessed with is the fruit gelee. Remember a little while back when I made one with rhubarb? Well R never got so much as a spoonful of that, because I polished it all off myself before he even realized it was in the house. Come on, R! With four siblings, you'd think you'd know how to fend for yourself when it comes to the best food in the kitchen! So I had to make it again. 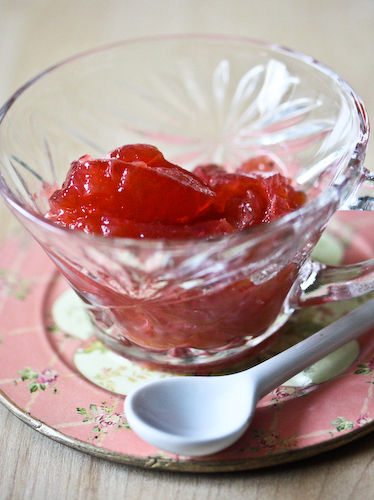 But this time, in addition to the rhubarb, I had about three cups of strawberries that were about to turn as well as a bottle of orange blossom water, and therefore the mixings for some serious fruit gelee. As I said, I'm all for the fruit cakes, and fruit bakes and crumbles and tarts. But for sheer ease and ability to refresh without any guilt (although I don't advocate guilt when it comes to food ever), nothing (seriously, nothing) beats the fruit gelee. And they are So. Flippin. Good. 2 envelopes knox gelatin, or 2 tablespoons powdered gelatin if you're measuring. Put the rhubarb and strawberries into a pot and fill with water until the fruit is just covered. Add the sugar and simmer the mixture until soft. Strain out the fruit, and reserve the cooking water into which the rhubarb and strawberry juices have just been rendered. Put the fruit aside in a 9x9" dish that will be going into the refrigerator. Return the cooking water to the heat and bring to a boil. Whisk the gelatin into the water, adding it slowly, until it fully dissolves. Remove from the heat and add the orange juice and the orange blossom water. Continue to whisk until the mixture froths. Pour the juice mixture over the reserved fruit and refrigerate for several hours until set. 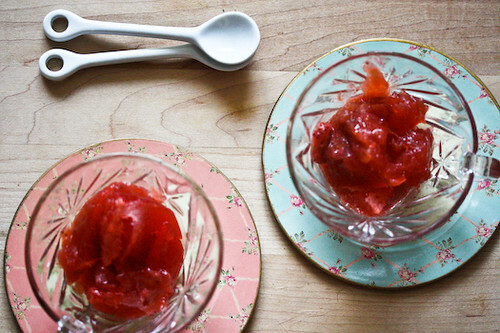 You can slice the gelee and serve on plates, or heap it into bowls or cups. interesting. I ve never had rhubarb since it s not available here so I m curious what it taste like. How interesting! I love the idea of strawberry rhubarb that's not in a pie or tart. I'll have to try this once the weather warms up. Hubby has been going crazy buying bundles of rhubarb at the Farmer's Market. Is taking advantage of when it's in season! He's been making variations of tart after tart. I will pass him this recipe for a little change of pace!